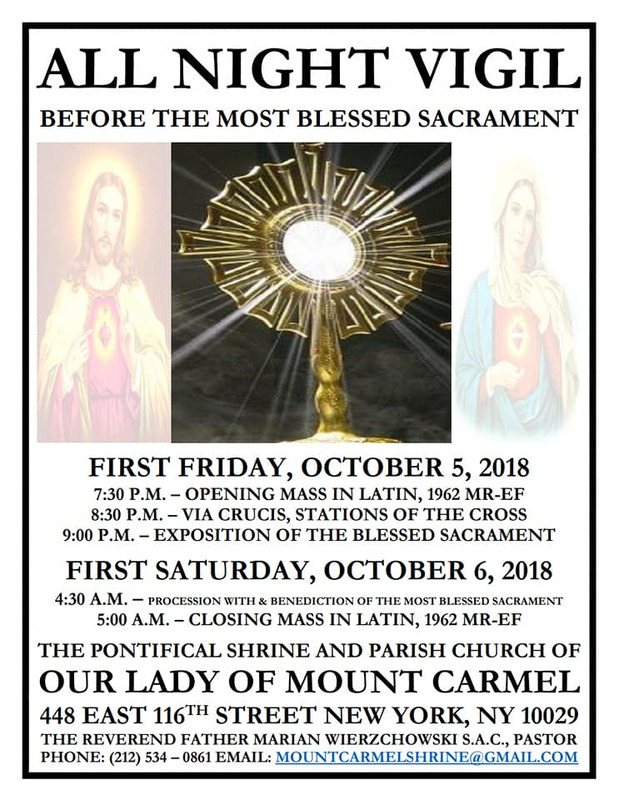 On October 5-6, First Friday and First Saturday, there will be an all-night vigil of Adoration before the Most Blessed Sacrament at the Pontifical Shrine and Parish Church of Our Lady of Mount Carmel in Manhattan, located at 448 East 116th Street. The opening Mass will be offered in the Extraordinary Form, beginning at 7:30 pm, followed by the Stations of the Cross. At approximately 9:00 pm, the Blessed Sacrament will be exposed and enthroned on the high altar; silent Holy Hours and vocal prayers will be offered throughout the night. 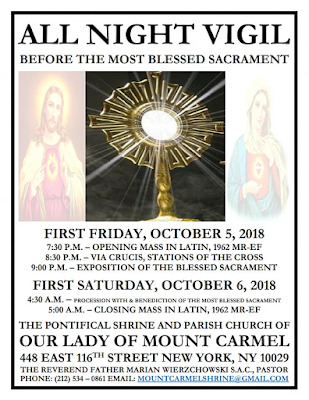 At 4:30 am, there will be an indoor procession with the Blessed Sacrament, followed by Benediction, and a closing Mass in the Extraordinary Form, beginning at 5:00 a.m. Mass intentions and candle offerings are available for this vigil. Gentlemen are invited to serve as acolytes for the Masses, the Stations of the Cross, Exposition, Procession and Benediction; ladies and gentlemen are invited to lead the prayers throughout the night. Benefactors and volunteers to assist in bringing and preparing refreshments in the meeting room, serving as ushers to guide the faithful, especially elderly and disabled faithful to the facilities of the stairs and restrooms.